Victorian silver antique sugar bowl & creamer by Barbour Silver Company in quadruple silverplate with the rims and the handles in the shape of twigs with applied berries and leaves at the ends of the handles. A most unusual set of antique quadruple silverplate holloware, this silver sugar bowl and silver creamer are in quite remarkable condition, with only a small amount of silver wear noted on the leaves/berries, and some silverplate wear (not silverplate loss) to the insides. No dings, dents or damage noted. 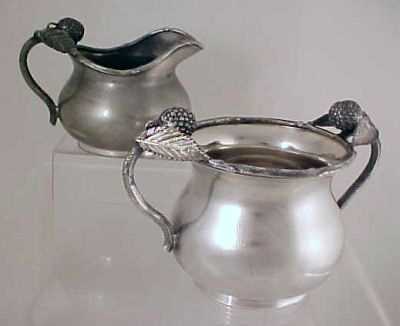 The bases are near pristine, and this sugar bowl & creamer set has the original quadruple silverplate - never re-silvered. The antique silver sugar bowl measures 5" from handle to handle, 3.125" in diameter at the top and 2.75" high to the rims. The sugar bowl weighs 7 ounces. The matching creamer has a much darker silver, both inside and out including the leaves and berry. We're not certain that this creamer has been stripped of its silver - it's unusual that the base retains the shiny quadruple silverplate while the remainder of the creamer is a darker, perhaps oxidized finish. The creamer measures 4.25" from tip of creamer spout to tip of handle, 3.5" in diameter, 2.75" high and weighs 5.2 ounces. Touchmarked on the bases with BARBOUR SILVER CO., QUADRUPLE SILVER and the pattern number 2033. You can read more about the history of Barbour Silver Co. at our Silver Manufacturers pages.